One person was killed and more than two dozen others were sickened by a carbon monoxide leak at a restaurant in a Long Island mall Saturday. 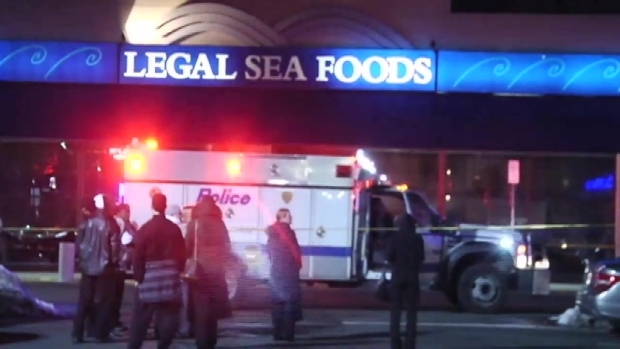 Rescue workers responded to the Legal Sea Foods restaurant at the Walt Whitman Shops shortly after 6 p.m. for a report that a woman had fallen and hit her head in the eatery's basement, according to the Suffolk County Police Department. After they arrived, police and emergency personnel felt nauseated and dizzy and believed it to be caused by carbon monoxide, authorities said. The restaurant was evacuated, along with two neighboring restaurants, and that's when the 55-year-old manager of the restaurant, Steven Nelson, was found dead in the basement. One person was killed and more than two dozen others were sickened by an apparent carbon monoxide leak from a restaurant at a Long Island mall Saturday. Michael George reports. Police said 29 others, including rescue workers and restaurant workers, were taken to hospitals. All of them had been released by mid-afternoon on Sunday. Nelson had worked for the restaurant for three years and had two sons, according to Roger Berkowitz, the president and CEO of Legal Sea Foods. In addition to the Legal Sea Foods restaurant, two others, Panera and a Cheesecake Factory outlet, were evacuated as a precaution, even as the mall remained open. A faulty water heater flue pipe caused the leak, authorities said. Huntington Chief Fire Marshal Terence McNally said the fumes were circulated in the basement by the ventilation systems at the restaurant. The building was not required to have carbon monoxide detectors, and there were none, McNally said. The carbon monoxide leak was "a wakeup call for commercial businesses'' and that monitors should be in all businesses, Berkowitz said. Rescue workers who were hospitalized said the carbon monoxide made them feel lightheaded and confused, and that it was lucky that the woman who fell was quickly found because it resulted in the fire department responding and discovering the leak. "It's fortunate that they found one patient early because that set into motion to get the fire department there to find out what the problem was," said Mark Cappola, a captain with the Huntington Community First Aid Squadron. "I can't speak for everyone, but personally, I think personally we were five minutes from really being in trouble." Carbon monoxide is odorless and colorless and can lead to death by suffocation. The restaurant was inspected last March, McNally said, and no problems found. Another inspection was scheduled for next month. The company has been issued a citation for defective equipment. McNally said the flue pipe will have to be repaired before the restaurant can re-open.